We are experts in SAP custom code, which traditionally has given many SAP customers headaches, because most performance issues stem from bad custom code. Whether you are migrating to SAP HANA and need your code adapted for the new column based database or whether you are experiencing general SAP performance problems, we can help you. Our tools create clarity, our intelligent Gekkobots ensure you get the right information at the right time saving you ressources for troubleshooting. And finally our automated fixes save you thousands of hours in code correction. All in all, the Gekkobots pay themselves back in less than a month. SAP Performance optimization. Speed up development cycle, save thousands of hours on troubleshooting and root cause analysis. 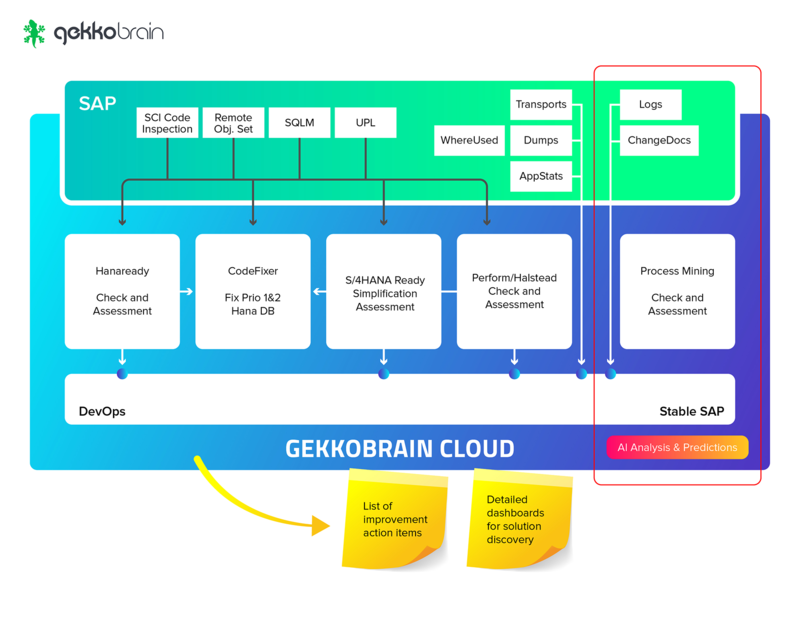 Read more about how you can optimize SAP performance with Gekkobrain DevOps for SAP. Complete analysis of your HANA readiness, automatic code remediation and migration to HANA. Read more about how you can migrate to HANA quickly and efficiently with Gekobrain for SAP HANA.